Church processions in Italy, celebrating the patron saint of a particular community, are, of course, not just religious manifestations. They are also displays of social cohesion and solidarity – occasions when emigrants return to their place of birth, re-establish family ties, bring their own new-world born children and join up for exchange of news and gossip and generally have a good time. 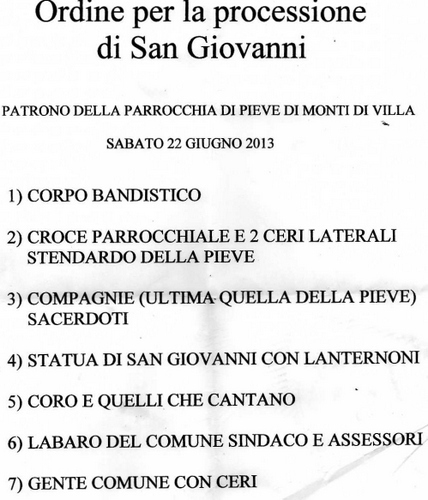 This is precisely what happened at Pieve di Monti di Villa’s Festa patronale yesterday evening. I entered a village with streets decorated with hundreds of candles and made my way to the church whose façade and campanile would be later outlined by a myriad electric lights. Perhaps before electricity came onto the scene after 1950 there might have been candles on that building too but I’m glad that that fire risk has now been removed. As you’ll know by now if you read my previous posts on the subject a Pieve was once the only church allowed to perform the sacrament of baptism. That’s why a Pieve is grander than other churches and also because it’s often placed in a central location with regard to other villages. Our own Pieve for Longoio is that at Controni and there’s a wonderful, now sadly unused one, at Sala on the opposite side of our valley. Now, of course, baptism can be performed at any consecrated church. Pieve di Monti di Villa’s church was originally dedicated to Saint Julia and dates back to the 12th century. In the thirteenth century it comprised a vast area under its jurisdiction including the now ghost village of Bugnano, Lugnano and the still flourishing villages of Granaiola, Montefegatesi, and Tereglio, It also looked after the hospice for travellers at Cabbi whose ruins I still have to find. The Pieve was rebuilt in 1446 and modernised between 1760 and 1766. Of the original construction it’s only the apse which still remains. Despite all these modifications the church is a very cohesive building and rather beautiful. Certainly, the adjoining priest’s lodging has an elegant loggia of the twelfth century. At first I thought the state of Saint John the Baptist ready for transport on his palanquin looked a bit like a re-make of saint Rocco. There was the raising of the cloak off one leg as if to show off the putrefying sore which kept everyone away through its pestilential smell and the saint was cloaked with a fine mantle instead of the animal skin which I always thought the Baptist donned. There seemed to be a dog which brought a piece of bread to the saint since no-one else would approach him. On closer inspection, however the dog turned out to be a sweet lamb, a symbol of the sacrificial Christ. The Mass was impressively celebrated by young Don Emanuele Rosi who has a fine voice and is certainly a fluent and persuasive preacher. A sad tinge entered into his sermon when he stated that the two old parish priests, who formerly officiated for Corsena and this area for over forty years, had at last found their final accommodation in a clerics’ retirement home. This meant, he said, that soon there would be just two priests officiating the whole of our Valley of Lima. The crisis of vocations is well-known in Italy. Just twenty years ago Lucca’s seminary had around two hundred seminarists. It now has three, two of whom are from outside Italy. Deacons help. One can get and become a deacon if married. But if one is unmarried and becomes a deacon then one is not allowed to marry, I think that’s wrong. The church needs all the help it can for new recruits to its officiants. Already the local nuns (all from southern India) at Bagni di Lucca Ponte’s children’s nursery help out. In case you didn’t know, deacons can do everything a fully ordained priest can do at a Mass except consecrate the host during the Eucharist, which is done beforehand by the priest. The relevance of all this for non-religionists is that a village Festa needs a patron saint to set it going and the patron saint has to be blessed by the priest before anything can begin. There was no shortage of choir members, however, who sang excellently under the direction of Maestro Cipriano Nesti. After the kissing of Saint John the Baptist’s reliquary the congregation began to get ready for the procession. The procession was beautifully picturesque, winding its way through the candle-lit streets of this delightful mountain village with further torches held by the local populace. The procession ended where it started, at the church, after a long circuit lasting almost an hour round this long and quite steep village – the same village where that wonderful living crib for Christmas 2013 was held. The strange juxtaposition of readings from the gospels about Saint John, congregational chants, the clanging of the bells personally swung by the campanari up on the top of the campanile, (i.e. no rope are used, the men themselves ring the bell Quasimodo-style) and the almost Fellinian marches played by the fine Corsagna wind and brass band reminded me of the incredible mixing together of so many elements in Italian life from sacred to secular, from pagan divinities to Christian saints into an amazingly coherent syncretism. The proof of the pudding, is of course, in the eating and the convivial meal at around 11 pm, consisting of farro, pizzas, salami, pasta fritta, coconut éclairs and a dozen other cakes all washed down with whatever drink one might choose from coke to wine, was a tasty ending to a great evening out in the wilds of the Italian Apennines. I just hope more young people might consider the rather austere but clearly rewarding job prospects of the priesthood for without these clerics a village patron saint Festa might so quickly become a faint memory, a bit like in Longoio where I live and some other surrounding villages. A rather wild thought: wouldn’t it be amazing to stage Wilde’s “Salome” in an Italian translation by a theatre group here! PS. Two reminders. It’s Bagni di Lucca’s turn to celebrate its patron saint, St Peter, this Monday at 9.00 pm at the Parish Church in Corsena and…….it’s Opera time again in Barga. Full programme at :http://www.operabarga.it/english/. 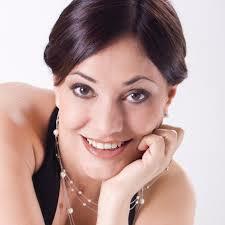 Barga opera unmissable! Thanks friend from Coreglia for reminding me about that and the appearance of great singer Roberta Invernizzi and her master class. I’ll be attending Handel’ pasticcio opera “Catone” this Friday. This entry was posted in Appennines, Event, Festa, History, Longoio, Opera, Religion, Spectacle, Tuscany, Val di Lima, Walks by Francis. Bookmark the permalink. So kind to comment! Will be very glad to accept your offer.